Worried about your commercial kitchen’s lack of access panels? Perhaps you’re renting a commercial kitchen, or you recently bought the property from a previous owner, and you recently realized that it doesn’t have all the necessary access panels. 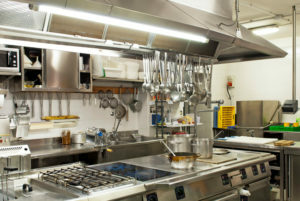 It’s really important for commercial kitchens to have access panels so that their exhaust system can be cleaned properly at regular intervals. But if your commercial kitchen lacks some access panels, don’t panic – just call Flue Steam. Our expert technicians can install access panels for you in accord with NFPA 96 and California Mechanical Code approved methods and materials. We follow all rules and regulations when installing access panels, and since we clean commercial kitchen exhaust systems every day, you’ll be able to rest assured that your access panels will be installed perfectly for optimal access. Hand scraping is the most common method of exhaust cleaning because it’s the simplest and most affordable. When it’s time for your exhaust system to be hand scraped, one of our technicians will physically scrape the accumulation of grease from the walls of your exhaust system. This method is effective at removing grease build-up, but it’s necessarily limited by how much of your system the technician will be able to access. Our technicians strive to access every possible area of exhaust systems, but cleaning every inch is impossible. That’s why we also recommend signing up for steam cleaning at regular intervals. This method cost more and requires more effort, but it’s also much more thorough. High-pressure hot water reaches into every inch of your exhaust system to deliver a more effective cleaning. We recommend that most commercial kitchen be hand scraped once a month, and steam cleaned on a quarterly basis. Sign up for monthly hand scraping and quarterly steam cleaning, and your exhaust system will always be in good shape without you having to incur exorbitant costs. We’re well-known for our exhaust system cleaning services, but we also provide various other essential services for commercial kitchens. Our technicians can help with key maintenance tasks such as checking belts, greasing bearings, and replacing parts. We can also provide all the ancillary fire safety services you need to maintain maximum safety standards in your commercial kitchen including grease filter exchange, installation and service of automatic fire suppression systems as well as portable fire extinguishers. Count on us for all your emergency repair needs, too. 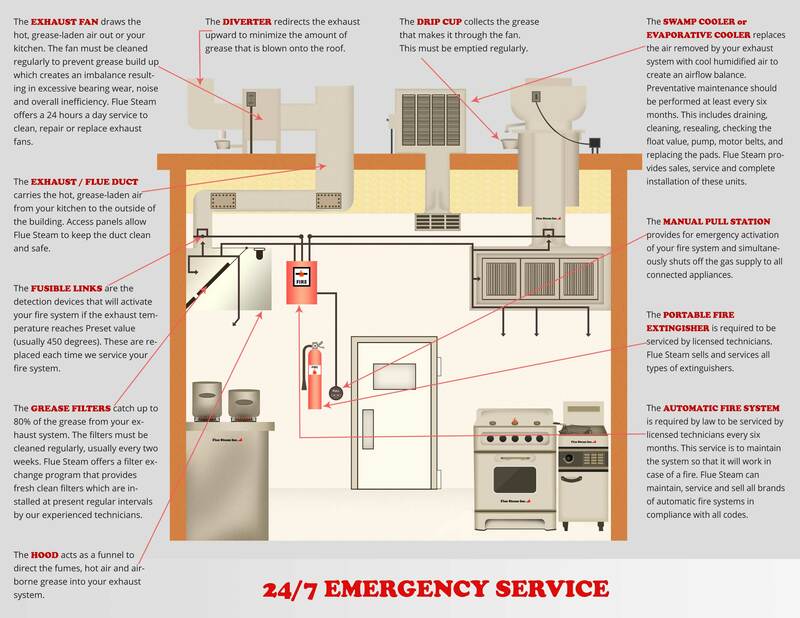 We can provide emergency repair services for your fan motor, swamp cooler, automatic fire suppression system and automatic gas shutoff valve anytime 24/7. Emergency cleaning services are also available. Get started now – give us a call at 800-700-FLUE!